On our most recent trip to Las Vegas, we had the opportunity to stay in one of the top-rated cabanas on the strip: the Cabanas at the Linq Pool. After experiencing a day at the pool at the Linq, I do not think I would do Las Vegas without a Cabana rental next time! ONE IT IS HOT IN LAS VEGAS! Period. The ceiling fan was a much appreciated feature of the cabana rental. Did I mention it is hot? 43c in July. TWO These are private. Loved the fact you had the option to be out of the sun and tucked away with some privacy. The cabana at the Linq holds up to 8 adults. And well, the cabana makes you feel kind of special! We also had an oversized jenga to play, which was crazy fun. THREE WATER! The cabana comes with ice cold bottled water, and plenty of it. Keeping hydrated in the heat is a must. We really appreciated this feature. And the water kept coming (scroll down to see what else was included at our Cabana at the Linq Hotel in Las Vegas. FOUR No fighting for a lounger in a prime location. You can sit back on the comfy sofa, or grab one of your private loungers at your cabana. Your cabana is yours the entire day.… You can come and go as you please, order lunch in, whatever suits your needs. … The pool was packed. So it was great to have your own space. The service from our server, Jenna, was superb. She was attentive and fast! She is yours all day, as well as some other wait staff.… She would find us in the pool, or wherever to make sure we were taken care of. FIVE The pool at the LINQ is 21 and over. So you get a full range of party goers. For us, it was fantastic to sit back, relax and enjoy the cabana and have a chance to visit and chat. We are sadly well over 21 these days, however, we really enjoyed the music and pools. We loved the option of being able to dip in the pools, participate in the day party, or just chill in our cabana. The pool is essentially a Day Party. We stayed there all day, until closing. We ordered lunch, a snack, and cocktails, which were very tasty. The menu can be pricey, but there are definitely some sharable items available. Because it was so hot, we were not all that hungry. Las Vegas Hotel Booking Tip: If you want to compare rates click here to see one of our favourite booking sites. We also recommend Hotels.com as they have a great loyalty program! The cabanas can be pricey, however, divided up amongst some people, it isn”™t bad at all.… The DJ played all day, and was fantastic. There was a radio station there as well, doing some giveaways. These poolside cabanas are offered at nearly every property along the strip. These would be ideal for families as well, keeping kids happy and cool, and you refreshed with beverages. Win Win! The LINQ Pool has a great vibe, and as I mentioned, the staff is fantastic. You won’t be disappointed. Make sure to book in advance, as these can get booked up quickly. Tip: Check to see the hours of the pools. Open and closing times vary though out the season. We stayed in Cabana #3, the furthest one, a little further from the action of the main pool if that is your scene. There are also hotel rooms with a cabana attached, which looked pretty fantastic! If you are looking for some action, check out these Stratosphere Thrill Rides! 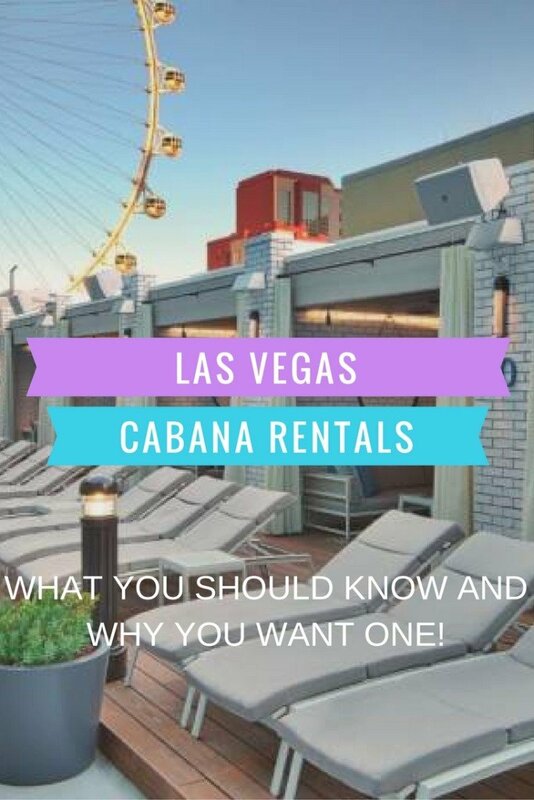 You can hover over this pinnable images of Las Vegas Cabanas… (or any image on my site) to quickly pin it !